I've finished my big sketchbook for books drawings. I like how these two came out! The Murakami (After Dark) was nice but I prefered Norwegian Woods, my favorite so far. "Kafka on the Shore" was great, too. Case Histories by Kate Atkinson was awesome. My favorite of all her books, now. And I loved them all! I love her take on life. She writes detective stories like she really feels along with the characters, not just for the thrill. Her books are a lot more than just detective stories. And she has a great sense of humor. The suitcase is mine, I found it in a flea market. And after drawing this I discovered that EDM 260 was : Draw a Filled Suitcase! Great. Haven't done an edm challenge for ages! 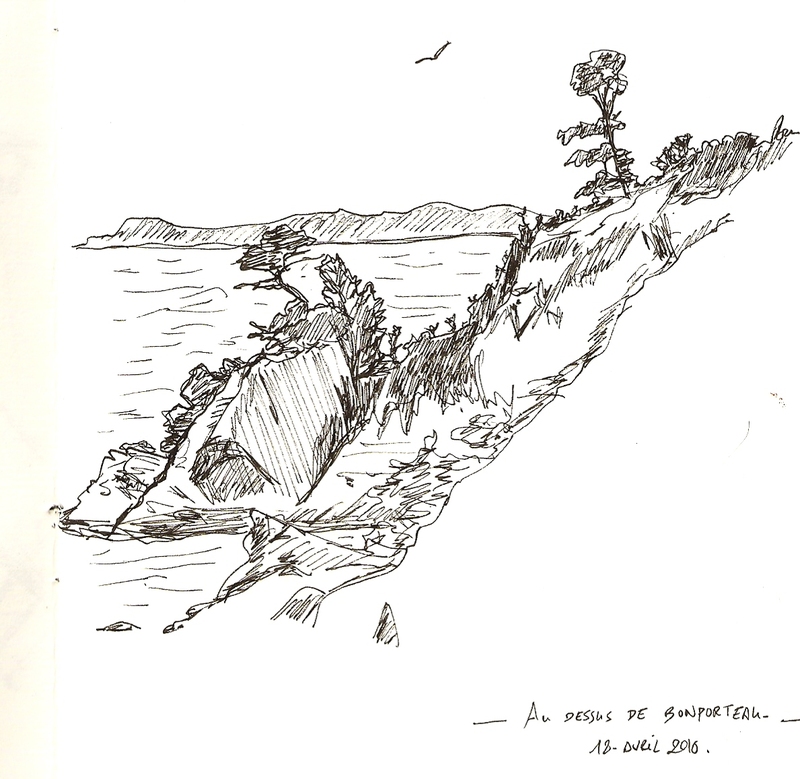 And this I did during a walk along the sea side. We have a beautiful coast here, rather well preserved and protected. And I realise I'm drawing more than before, even though I still don't feel like it. Awesome Kazumi! I was drawn by the books drawings, especially the one on the right, it's just so well done! 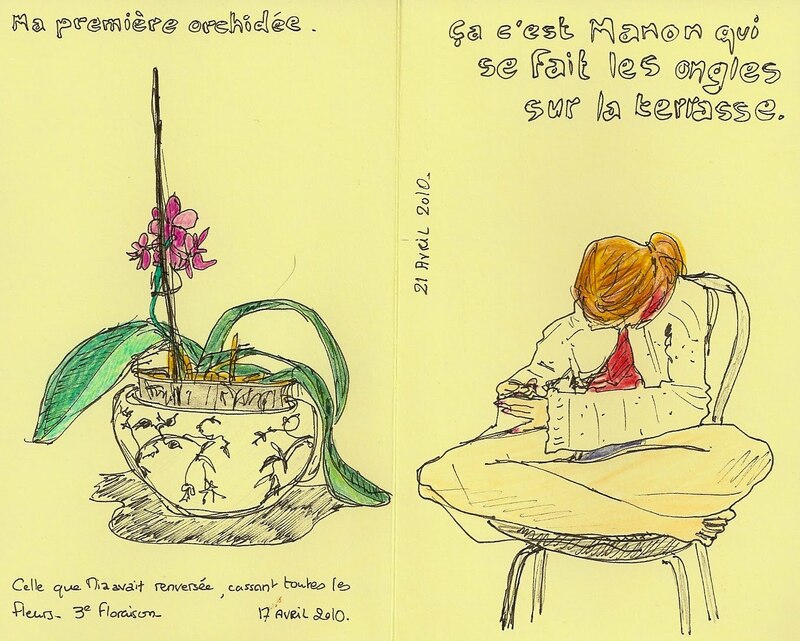 These are all wonderful drawings - and take us along with you during your daily experiences. I agree with the others, these are all very good. Although your daughter is disproportionate, it's a great capture of an everyday event. Tres belles pages, j'aime toujours tes couvertures de livres et celle-ci sont vraiment super, les gradations de bleus et le lettrage du Murakami vraiment réussi, le Atkinson très beau.Ce serait interessant de voir un diaporama de ton sketchbook sur les couvertures de livres. La valise est super avec un petit coté Magritte. J'aime aussi beaucoup Manon qui fait ses ongles, on y sent toute la concentration du sujet et j'adore les proportions différentes. Le paysage aussi est super. Kazumi - I love the serene coastal scene. great drawings! Even love the big legs! These are great drawings and pictures. Next time perhaps your daughter will sit still for a few moments so you can get the proportions right! Love the coastal scene. Your fish in a suitcase is great. My dream book says the fish is your creative side and if the fish is outside its normal environment then it needs to be taken care of or helped to find an environment that it can blossom in. With all these drawings it looks like you are taking your creative side seriously and perhaps the suitcase just fits with you wanting to find that new home that fits you better than where you are now. Great work. Wonderful sketches and art. Thanks for sharing them with us. 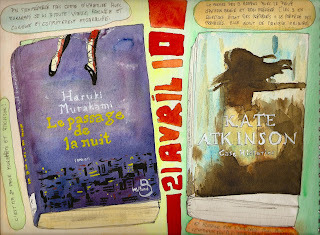 Just love the book drawings! These are so well done! And the fish and the suitcase - so creative. I also love the pen and ink sketch of the coast. And the intense concentration of your daughter. Wonderful! All wonderful! You know what I would love to see? A slideshow of that sketchbook for book drawings! These are really so wonderful! And I have to say that I've been inspired to read of few of them! I'm going to go check on Kate Atkinson at the library next time! Your fish in the suitcase is hilarious and I think my family would agree that your dreams are as bizarre as mine! I once dreamed that as I walked along a path, I looked over and in the river there were two otters---wearing wetsuits. Nothing more. That's it. I should sketch it out! Yours is wonderful! I'm glad your sketching again! 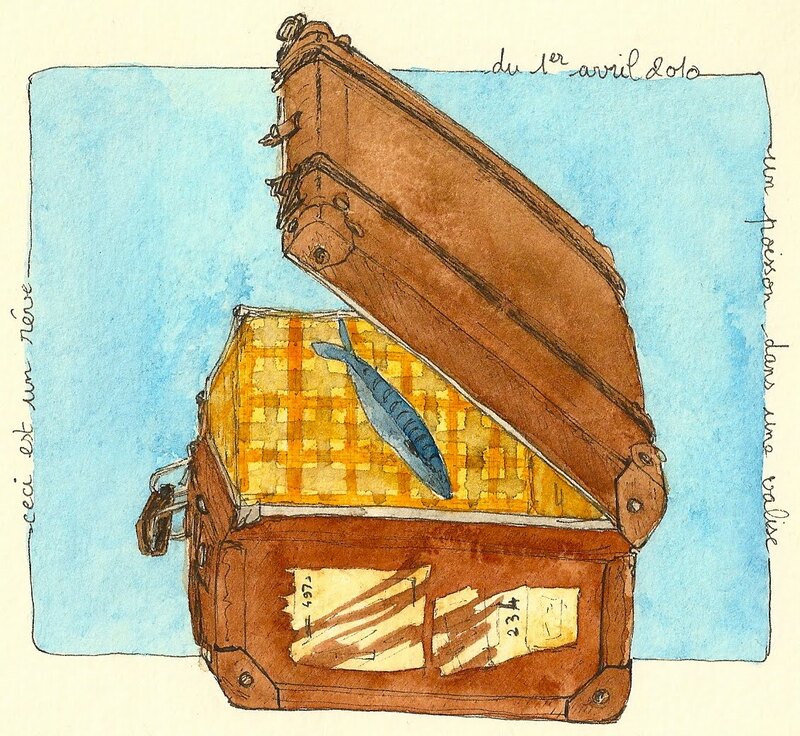 Lovely book sketches and I bet that's the only suitcase we'll get for that challenge with a fish in it. Lovely sketches all round! lovely sketches! my favorite is the suitcase.